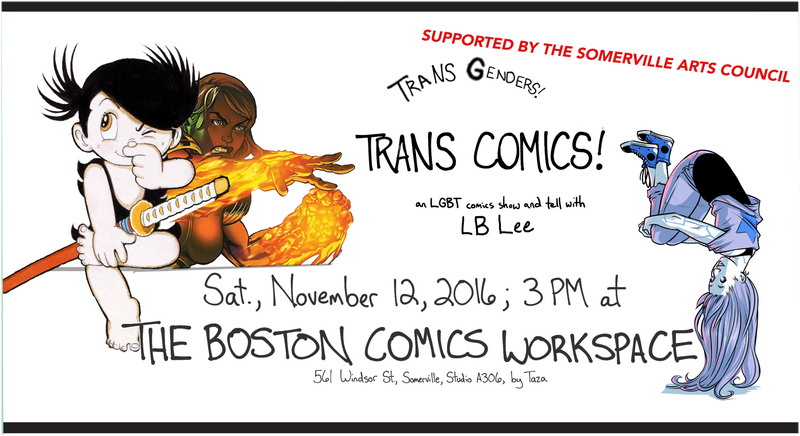 The Boston Comics Workspace– with help from The Somerville Arts Council– is presenting a series of comic artists who will speak about their work, their process and the history of non-traditional comic representations. Come and see these amazing presenters in November and December. Taylor’s work, whether autobio, fiction, or comics essay, has explored issues revolving around identity. From early works to her now in-progress comics, Taylor will walk you through her comics journey, exploring themes, influences, artistic techniques, and storytelling approaches. As the final event in our series, Whit Taylor will be presenting her work. Whit is an early member of the Boston Comics Roundtable and has since moved to Brooklyn, to much success. From Vixen Varsity: “Whit Taylor is a Brooklyn-based cartoonist and comics writer. She won a 2012 Glyph Award for her self-published comic Watermelon and was a 2013 Ignatz Award Nominee for her series Madtown High. She also writes comics reviews and articles for Panel Patter, The Comics Journal, and Comics Workbook Magazine.” We’re super excited about her presentation!! This workshop is funded in part by Somerville Arts Council. Non-traditional Character Design with Catalina Rufin. This workshop is about the process of coming up with the beginnings of a comic character from initial brainstorming to creating a story world for this character. 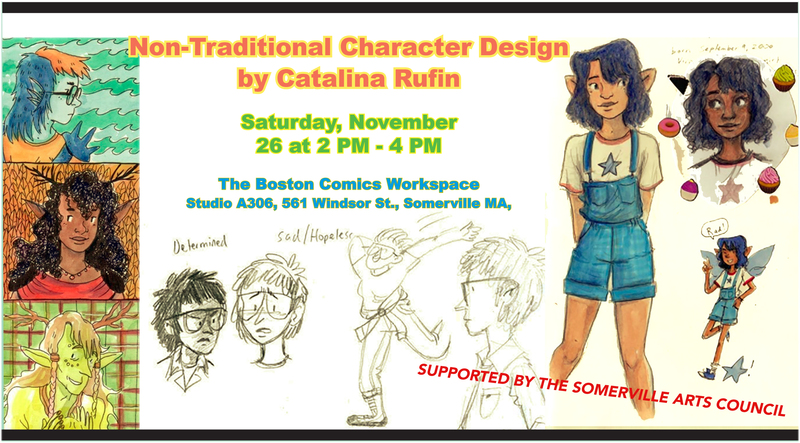 Catalina will discuss character design, finding inspiration in media and personal experience, the importance of concept art, and creating a pilot or ashcan comic as a preview for a longer series. I will reference my own works and how the process helped me get started on projects. For anyone who is stuck on their next comic, or has a big idea and is hesitating to start, this workshop will be a great help. From the gender anarchy of Krazy Kat to the transgender webcomics of today, genderful characters and creators have always been with us in comics. Come for a slideshow and talk about this hidden history of the past hundred plus years, and how perception of them has changed!